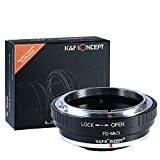 Solid metal mount lens adapter allows Canon FD lens use on Olympus/Panasonic micro 4/3(Micro Four thirds) camera body. For Olympus PEN E-P1 P2 P3 P5 E-PL1 PL1s PL2 PL3 PL5 PL6 E-PM1 PM2 OM-D E-M5 E-M1, Panasonic Lumix DMC-GH1 GH2 GH3 GX7 G1 G2 G10 G3 G5 G6 GF1 GF2 GF3 GF5 GF6 GX1 GM. With precise design and high technology.Made of brass and aluminum (not plastic); Smooth surface for effortless mount; Anodized aluminum construction.Install, remove and operate lens smoothly. This entry was posted in Discount Photography and tagged 3K&F, Adapter, Cameras, Canon, Concept, FDM4/3, four, lens, Lumix, Micro, Mount, Olympus, Panasonic, thirds by Ball Photo. Bookmark the permalink.